The Arby’s secret menu is full of meaty goodness. From a mountain of meat to new spins on classic menu items, any meat lover will go ga-ga over Arby’s secret menu. 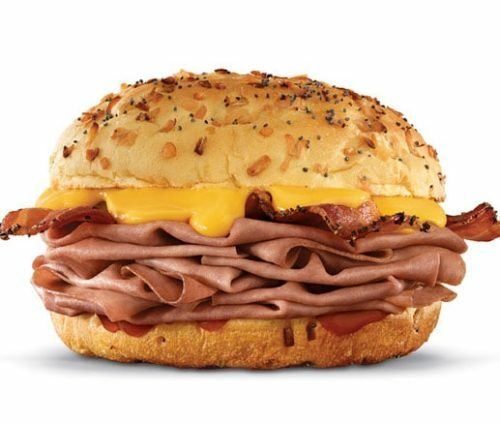 Arby’s already offers a different fare of food than your typical fast food chain, but if you add in these delicious secret menu items, you’ll be glad you went! If you do try out any of these secret menu hacks for yourself, be sure to take a photo and post it on our Secret Menu Facebook page! What is on the Arby’s Secret Menu? If you love meat, an Arby’s Meat Mountain sandwich will probably have you drooling! And so it should. Starting with a chicken tender base, it moves up with roast turkey, ham and swiss cheese. The meat continues with brisket, corned beef, angus steak and cheddar cheese. Finally, the proverbial cherry on top is the crispy bacon. This sandwich goes beyond expectations. Just head into an Arby’s and ask for the Meat Mountain. If they don’t know what you’re talking about, just let them know you want all of their meats stacked on a bun. 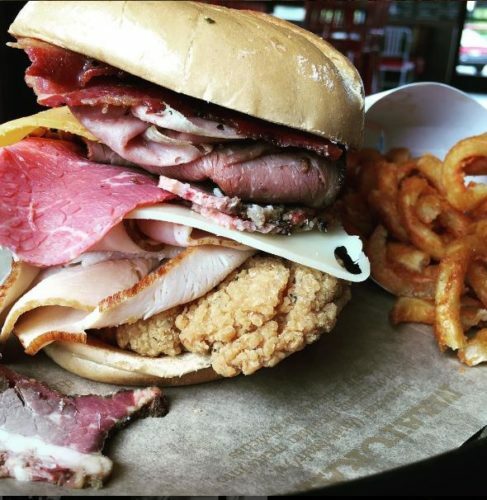 Most Arby’s honor the Meat Mountain request, but some will not. And it will cost you $10, so go hungry! The Arby’s Melt used to be on the Arby’s regular menu. But now it is a part of their secret menu. This gooey, creamy feast is a cheesy twist on the classic roast beef. 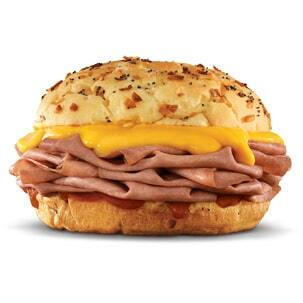 It contains two ounces of roast beef, topped with their delicious cheddar cheese sauce, all a classic sesame seed bun. If you thought the Arby’s Beef ‘n Cheddar was the bomb, just wait until you try this secret menu hack! 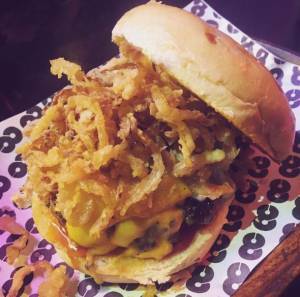 All you need to do is ask for the Bacon Beef ‘n Cheddar. This will get you an extra serving of bacon to the thin-sliced roast beef, cheddar cheese sauce and onion roll. Go to your nearest Arby’s, ask for this secret menu item and they should deliver. Instead of the usual 3.5 ounces of corned beef, you get a full 7 ounces of this canned meat! That’s one hefty dose of protein, and one delicious menu hack. If you want to mix it up a bit, you can order 7 ounces of delight with half corned beef and half roasted turkey. In fact, you can play around with this as much as you want. Get more cheese, more sauce–more of whatever you like. 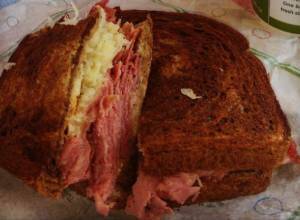 The French Dip Max is like the Double Stacked Reuben, it has double the meat. What will make the Arby’s French Dip better? Instead of the normal 3.5 ounces of roast beef you get 7 ounces. 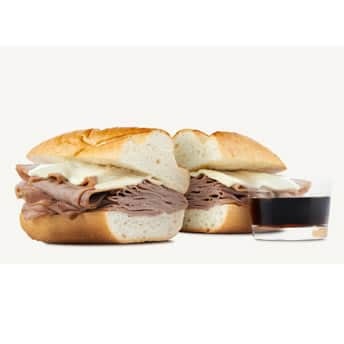 Your Arby’s French Dip Max comes on a sub roll with 7 ounces of thinly sliced roast beef and their French dip sauce. This is another fresh take on the Arby’s classic roast beef sandwich. When you ask for the Junior Deluxe, you’ll get the sesame seed bun, roast beef pile, and some lettuce, tomato and mayo. It’s a little lighter than some of the other options on this page, but you can beef it up in any way you choose. With 3.5 ounces of roast beef, honey wheat bread with lettuce, tomatoes, onion, big-eye Swiss cheese, mayonnaise and spicy brown mustard, the Roast Beef ‘n Swiss is a joy to behold. Not unlike a deli sandwich with all of the trimmings, this is one of our favorite secret menu items at Arby’s. Just take a look at that picture and try not to drool. If you succeed, you have more self-control than we do. But you can keep your self control–we’ll keep the Roast Beef n’ Swiss. Another deli-like sandwich, here you have thinly-sliced ham piled high on honey wheat bread with big-eye Swiss cheese, tomatoes, onion, mayonnaise and spicy brown mustard added to the mix. This sandwich tastes like the American classic. But with an original twist. Another hidden secret at Arby’s is what they call the bread switch. 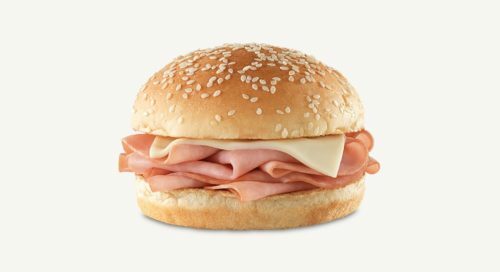 Without an additional charge, any sandwich you order at Arby’s can come on any of the bread that they serve. 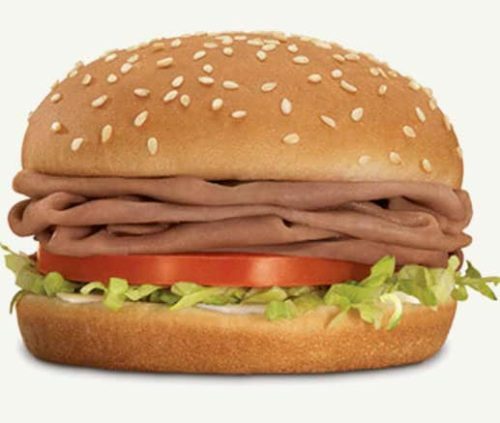 If you want the Arby’s classic roast beef on honey wheat instead of the sesame seed bun, all you have to do is ask! With this secret menu hack you can create all sorts of combinations. You can even combine several different buns to create the ultimate deli-sandwich. 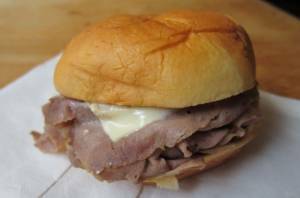 The Super Roast Beef has a whole bunch of extras added to the Classic Roast Beef sandwich. 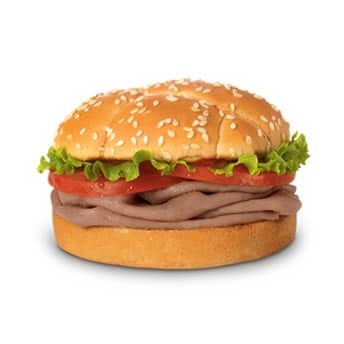 It contains 3 ounces of roast beef, lettuce and tomato all topped with their special red ranch sauce and served on a sesame seed bun. Take the classic to the next level. 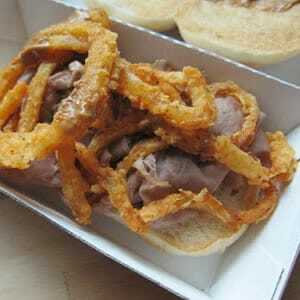 Arby’s has these tiny fried onion ring strips they serve on one of their specialty sandwiches. Well, you can ask for them to be added to any Arby’s sandwich you desire! A little fried crunchy goodness on any sandwich you want.